After the terrorist attacks in Paris last Friday, I feel tremendous sorrow for the victims, and anger at the perpetrators. The attackers struck at ordinary, peaceful people who were enjoying food, drink, sport, music, and the company of friends and family. All of us, especially our leaders, must temper anger with wisdom. I hope our nations react with courage and resolve, but also with restraint. In particular, we must not allow a backlash against innocent Muslims, including refugees who are fleeing the very sect which committed the Paris attacks. At this time, our commitment to freedom, justice, and democracy is being put to the test. History has demonstrated that discarding our principles will not make us safe. Eiffel Tower image by Jean Jullien. I'm still on a blog break for Nanowrimo, but I will have more to say in December. 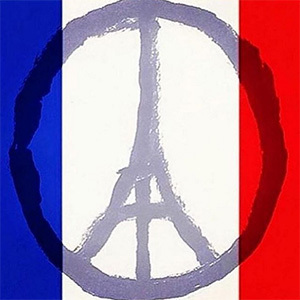 Sadly, the consequences of the Paris attacks will be with us for a long time to come. For now: Vive la France. Liberté, egalité, fraternité.